They teach you at newspapers that cliches are bad. Find some originality. Turn the words your own way. But there’s something to be said for cliches. They become cliches because they have a certain cache, resonance, meaning. And let’s be honest: If it wasn’t for the cliche in this headline, I’d be writing about only one thing: The ugly. But that would depress our readers even more. We don’t like to depress our readers. Depressing our readers is bad. Philadelphia Union should take note. So here is one scribe’s quick look at the ugly, the bad, and the good for the Union. Aaron Wheeler/Austin Berry center back pairing: Never again. A three-man back line absent Amobi Okugo: So yeah, that didn’t work out so well. The Union’s record: What? The Portland Timbers and Los Angeles Galaxy are in 8th and 9th place in the West? OK, you can feel better now. Um. Well. No, maybe not. Mo Edu, first man in USMNT camp: Too hurt to play for the Union on Wednesday because of post-concussion symptoms, but just fine to practice Tuesday and get a clean bill of health Thursday in USMNT camp? Riiiiiiiiiiiiight. WSSM: Union fans know what WSSM means. Ray Gaddis on set pieces: Gaddis is one of the league’s best open field defenders and one of the league’s worst set piece defenders, as he showed again on New England’s first goal. Someone find him an old mix tape with Kriss Kross and Van Halen. The Mac Dad will make you jump. The Mac trade: The Jack Mac, on the other hand, will make you cry. He has scored four goals in his last four games. On the bright side, Andrew Wenger runs really hard. Montreal better be picking up part of Wenger’s salary. Chaco Maidana’s red card: The ref pulled the wrong card. Harsh. Rather unfair too. Union defensive depth: They may have numerical depth, but they don’t have actual depth. They still need a left back. They trust their backup center backs less than a converted forward. Philadelphia should have reacquired Jordan Harvey when they still could. A Crystal Palace friendly: Crystal Palace? Wait, that’s a team? Sounds like an Atlantic City casino. Patrick Mullins: All he did was win the Hermann Trophy twice, and there he went, slipping all the way to No. 12 in the draft. Every MLS team, including Philadelphia, should be kicking themselves. Danny Cruz: He big-timed Kansas City like nobody’s business. His goal was one thing. But his reaction after the KC goal, to basically bulldoze his way through KC’s defense, was even better. Pure bulldog. Word has it he worked on his game all off-season at YSC. It shows. That lead touch looks a bit softer. That goal celebration against Kansas City: Okugo, Gaddis, Williams, Cruz — These are Hackworth’s guys. That spoke volumes. Amogi Okugo, midfielder: I’m one of those people who really likes Okugo at center back. But boy, he sure looked good in midfield against KC, didn’t he? Better than Edu has. Zach Pfeffer: Let’s see more of this kid. Maidana is suspended, Fernandes has been invisible, the midfield is gutted, and Pfeffer looked pretty good against New England. A week in SoCal: Back to back games in Los Angeles? Time to spend the week in SoCal. That’s what this team needs. Relax. Loosen up. Clear your mind. Ignore Twitter. Soak up the sun. Start fresh. Don’t read anything from Philadelphia fans. Go hang with the Farfans. Maybe Gabe can guest play at left back. Sebastien Le Toux, striker: Jack’s gone. It’s time. Why not? Vincent Nogueira: One of the top five midfielders in the league. A deserving All-Star. Just pure class. Pay him whatever he wants. Find a way to keep him. There is no player like him in MLS. 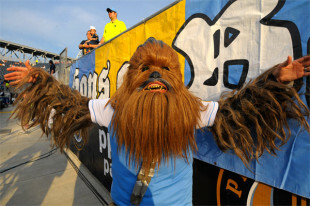 Wookiees: Yes, that was a wookiee at PPL Park on Saturday. Can he play center back? Those Hollywood types out in Los Angeles always let the wookiee win. Good article, Dan. One that I’d add to the good has been Zac MacMath’s improvement this year. Could he have done better on some of the goals? Of course. But when you add in the number of “Holy crap” saves plus his improved distribution, he’s definitely making his way towards the top of the league’s keeper list. One other thought. What about trying Danny Cruz at striker? While he may not have the finishing touch that Jack had, he’s certainly capable of making the off the ball runs and if Vince and Chaco can get him the ball enough times, one or two are bound to go in. Totally agree about Zac. He still has room to improve, especially in commanding his area, but it’s a really good sign that he has stepped up his game this year. He’s making those “big time” saves where before he was coming up small, and he just looks so much more confident in himself. One comment on the Crystal Palace friendly. I’m actually pretty excited for it. They obviously do not bring the name recognition of other EPL clubs, but what Tony Pulis did with Palace this year to turn them from a relegation certainty to an exciting team who challenged, and beat, top teams is nothing short of magnificent. In Gayle, Bolassie and Puncheon, they have pace and excitement and I imagine that they will want to raise their brand in the states by bringing their full A side to play the Union. If only they could bring some of their amazing fans along to add to the atmosphere. What this game may lack in star power, it should easily make up for in fun and energy. I for one am looking forward to it. +1. Actually have liked all the friendlies: Stoke, Schalke, Real Madrid… One if the best things the FO has done. +1 . . . only problem is I wonder if Jedinak will play as he’ll be coming off World Cup. He’s my favorite player on that team. Totally agree. The ticket sales won’t be great for a lesser known side, but anyone who watched EPL with any kind of regularity this season knows this is a pretty exciting team right now, hopefully in ascendency. I don’t mean that as a slight to Dan, who made a perfectly acceptable joke at the little London’s side’s expense. I don’t have a dog in the hunt in EPL, so I find myself mildly rooting for the newly promoted sides each year, and these guys were a blast to see hatch. They sum up what’s great about the relegation and promotion system. Hopefully they can get a proper kit now. True, it’s good that people are interested! Totally agree. I am excited for this game. Anyone who seen their home games on TV, let alone been to one, can tell you that they have one of the best home crowds anywhere. You also have to expect that they are going to play their starters and bigger names (like Villa did) and not their reserve team with a smattering of starters (like Celtic and Everton did). I am interested to see what we get from Edu when he comes back. I think so many of our problems stem from him underperforming and not being able to impose his will on the match. He looked strong in the first few matches and it really seems like once he firmly got himself back on Klinsman’s radar, he backed off like he wanted to make sure he didn’t get hurt before USMNT camp. So many of the tactical failings and the lack of development to this point come from him providing nothing. I get counterpoints to your point each time I make it and just don’t understand. I agree completely. Its as though Edu’s only motivation for the team is the USMNT at which point, have a nice day sir- go play somewhere else. — less you come back in late July and show me something. Anything resembling the player I thought you would be for this team. Well said Chopper. I concur. Do you think it has something to do with his role not being defined… or Carroll being on the field with him? I hope, and don’t believe it’s his mind set. I believe his best position is CDM… like Beckerman at the point of a four man midfield diamond. He has get forward tendencies and can go box to box. Playing him with Carroll is dumb, and pushing him out wide doesn’t seem to work. Agree with you guys that he needs to come back and show more than he has. I think he is certainly capable of DM by himself and do not think 4-2-3-1 is necessary. He should be able to patrol DM by himself- he has the quality. I also think he would do fine in the 4-3-3 so long as he recognizes primary responsibility is as DM a la Busquets. Sergio gets forward but always thinks defense first. Personally I am inclined to agree that Edu in the Beckerman role is best fit for him and the team. Diamond 4-4-2. That gives him opportunities to get forward on set plays and sporadically in the attack to maybe unlock defenses with a through ball. I am not in love with Maidana as the 10. He is a winger in my mind, though without real break away speed. I like him in an inverted position on the right with chances to attack laterally across field- having the strikers make runs in the opposite direction where he can thread the through pass. He has that kind of vision I think. Edu and Noguiera as the spine of the diamond I think is in best interest of team, less of course Ribiero is on his way up. I agree with your assessment of Edu and Maidana, which is why I’d prefer a 4-1-3-2. Since Nogueira is not really a CAM, he can play in the middle of a flat-3, flanked by Cruz and Maidana. Wenger [or Casey] can act as a hold-up forward to fill the space in front of Nog, with Le Toux paired next to him up top. I’m a Carroll fan, but with 2 other box-to-box guys his skill set is no longer beneficial. Unless he tries a spell at CB and pushes Okugo forward while Edu is gone. No I think it comes back to effort. In the first two games he was physical and forcing the issue. He made the best XI a couple of times. A few articles came out basically saying he had earned his way back into camp and he took his foot off the gas. He really looked like he was making sure he stayed healthy instead of challening and using,his strength which regardless of where he is positioned is how he should play. Let’s see what he does when he comes back. If he is not on the plane to Brazil, maybe we get a pissed off Edu who has that bite. Fastest red card in MLS is by RSL Ritchie Kotschau who saw red 8 seconds after entering a match in 2006. That was tweeted by RSL during the Union game when someone asked the same question. I… I can’t even imagine how to get red in 8 seconds. What did he do, come on and punch somebody? Someone a few weeks back made a great call regarding Noguirea… something like: Pay him whatever he wants, give him a 10 year contract, and give him the keys to the Youth Academy. I’m on board with all of that. Yes to all of the above! If I was gonna have another kid, I’d name him Vincent. Great article and analysis. I especially appreciate the humor. Sometimes laughter can ease the pain and disappointment and help us remember this is a game. +1 on Zach being good. Maybe too early to say Blake drafted as #1 as Bad…..but we knew LB and CB were going to be weak and developing Blake to trade him doesn’t make sense. Mullins: I told everyone at the draft (near me) that we should get him. Union and all others outsmarted themselves. This staff has blown almost every draft. I get they got the best player this year, but they passed up on so many other talents. Hind-sight is 20/20, but even the players who have shown some promise have not blossomed, or have not been handled well. Okugo in 2010, Zac in 2011 and a great grab with Gaddis in 2012. Plus Blake, Ribeiro and Marquez from this year, and that’s it. So include past drafts and awful trades as Ugly and a reason why this team is still not a playoff contender. That’s not blowing every draft. That’s nailing most of them. They got two starters out of the first draft. Perk is a quality backup for LAG. (They should’ve kept him, but I got the feeling at the time that he was let go kind of at his request so he could go home to LA.) In 2011, they got 2 more starters, one of whom they sold for a transfer fee. In 2012, they got another starter. In 2013, they had no first round pick. 2014 has yet to pan out, but their draft was widely praised. I don’t have any problem with MLS trying to stamp out challenges like Maidana’s with straight reds. It wasn’t as bad as it first looked,but it was rash, reckless, and dangerous. I’ve liked that MLS refs have been fairly good at punishing that sort of thing…we have too many Zakuani stories. To this day, I still remember the sound his foot made. I just happened to be watching that game and BOOM! Many truths…agree especially with the depth comment. And Le Toux at striker shoulda happened when Jack was sent packing. Re: Pfeffer: I def wanna see more of him however I do not think we should just start him…I see a Fernandez like scenario happening. We were all high on Fernandez after an early bright showing and now look at him, his confidence is shattered. Subbing him into a game at home in which we we already losing 5-1 was the perfect time to get his first minutes. New England had already let up and were pretty confident they were getting 3 points. Really no pressure on him to perform, he had fresh legs and they were tiring. He had a good appearance and showed why everyone is high on him. Starting Pfeffer against LA who can’t wait to play us just aint a good idea. 70th minute sub…losing or tied game may be best time for more Pfeffer. Pfeffer’s played in Germany. He’ll be fine. He’s not slow and lazy and disinterested like Leo. Leo played at Stony Brook, which is not in Germany. This is such a poor assessment and one the like of many on this site. And do you really think playing in Germany for reserves with other kids is comparable to the MLS? Really? Leo lost his confidence because he was playing well and then all of a sudden he wasn’t playing at all. He’s not lazy, he’s just unsure of himself, which could be resolved with more playing time. And a good manager motivating him and keeping his focus. For the record I think the site writers do a good to excellent job with analysis and display an above average understanding of the game. My comment is more directed at some commentators. I do think Leo has had a crises of confidence and one of the first things to go in futbol when you have confidence issues is your touch. His poor touch of late has him playing behind in my opinion. Always trying to catch up to whatever idea may be in his mind. And for the record, I absolutely think German reserves is comparable to MLS. Not better nor worse but at least comparable. But that’s me.